EDINBURGH Trams carried nearly five million people in its first year, beating expectations and boosting the case for taking the line to Leith and beyond, transport leaders have said. Figures revealed today show that there were 4.92 million passenger journeys on the tram in the year since its launch on 31 May, 2014 – 370,000 more than its 4.555 million first-year target. The service also performed slightly better than expected financially, but will still make an operating loss for another two years. 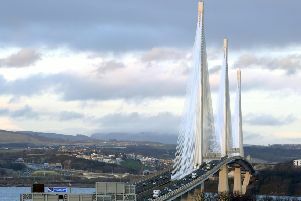 Edinburgh Council transport convener Lesley Hinds said she hoped the figures would help boost the case for extending the tram as far as Newhaven, as originally planned before the project was crippled by cost overruns and contract disputes. Councillors will vote next month on whether to endorse a new business case for finally laying tram tracks down Leith Walk, with SNP councillors revealing this week they were willing to support the extension if the sums add up. Ms Hinds said: “People have now had the experience of the tram running in the city for a year, and the numbers are bearing up. Of course that will influence the decision. “It was always said that the business case was for a line from Newhaven to the airport, so that’s what we want to strive to do. Ticket revenue was three per cent higher than the £7.949 million target, but the service was still expected to make a loss of almost £1.3m this year. It will only begin to pay for its own day to day operation in 2017-18, but ongoing maintenance costs to vehicles and tracks will mean the council is only projected to see an overall return after 2029.